Powers/Abilities: Ashe was a chemist who, via unrevealed means, discovered a type of dust that could disintegrate living tissue. (Team America#10 - BTS) The man would later call himself Mr. Ashe was formerly a lowly chemist. Working in his lab, he discovered a type of dust that was capable of breaking organic matter down into a fine powder. Quitting his job, he relocated to Nevada and formed the Children of the Dust, a cult dedicated to pure hedonism and the accumulation of wealth. He used his special dust to keep his acolytes in line. (Team America#10 (fb) - BTS) Ashe’s power grew as the size of his cult increased. With the money taken from the members of the cult, he established a small commune outside of Las Vegas. He also hired the best lawyers in the state to be at his beck and call. When the Las Vegas police department tried to open an investigation into his activities, Ashe’s lawyers harassed and sued everyone involved in the case. The city decided that it would be cheaper to take a ‘hands-off’ approach when it came to the group. 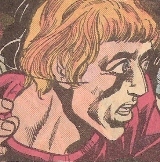 (Team America#10) – Ashe tracked down a member of his cult called named Joseph Gill. Ignoring the man’s pleadings, Ashe exposed the former CIA agent to his deadly dust, killing the man instantly. Knowing that Gill sent a letter to Honcho, but unaware of the letter’s contents or true purpose, Ashe and his cult waited outside the hotel where Team America was staying. When one of his cult members failed to kill Honcho in his hotel room (Ashe was alerted when the man jumped from the balcony and exposed himself to the deadly dust, turning into a free floating cloud of particles and loose clothes), Ashe and the rest of his group surrounded Honcho and R.U. Reddy when they tried to discover what happened to the assailant. Knocking both men out, the group made off with Honcho and left Reddy passed out in the street. Taking Honcho back to their commune, Ashe saved the former CIA agent from a deranged cult member before grilling him for information. Revealing to Honcho that he knew of the man’s background, both with the CIA and the late Gill, Ashe tried to threaten Honcho with the dust. When Honcho refused to tell him what he wanted to know, Ashe locked him up in the lab. Later, after locking up the trespassing Wolf and Reddy, Ashe decided to simply kill all three men. A well-placed flare distracted Ashe, allowing the teammates to escape. In the resulting confusion, Ashe slipped away to adjacent airstrip. Flying off in his personal jet, Ashe planned to fly to Las Vegas and bomb it with a deadly dust cloud. Ashe’s plans were crushed when the mysterious Marauder raced from out of the desert and boarded the plane. Ashe used a sizable amount of his dust on the black garbed rider, but to his horror the Marauder was immune. Knocked aside as the Marauder took over the controls, Ashe set fire to the plane as it was landing to cover his escape. Gathering several of his followers, Ashe led them back to Honcho’s hotel room. Waiting in ambush, they confronted Team America and easily took them captive. Seeing the letter Gill mailed, Ashe snatched it from Honcho’s hands and opened it. To his horror, he found that the envelope was full of his own dust. Exposed, he wilted away to nothing before the horrified eyes of his cult members and Team America. Comments: Created by Steven Grant (writer), Alan Kupperburg (pencils) and Vince Colleta (inks). Well, his name may very well have been Ashe, but there was no hint in the story if that it was his real name or the name he picked for himself. Formerly a CIA agent, Gall joined Ashe’s cult for unknown reasons. Despising James McDonald, he stole a sample of Ashe’s deadly ash and mailed it to McDonald’s hotel room, hoping to kill the adventurer. Ashe interpreted this as Gall trying to warn outsiders of his cult and murdered the man.